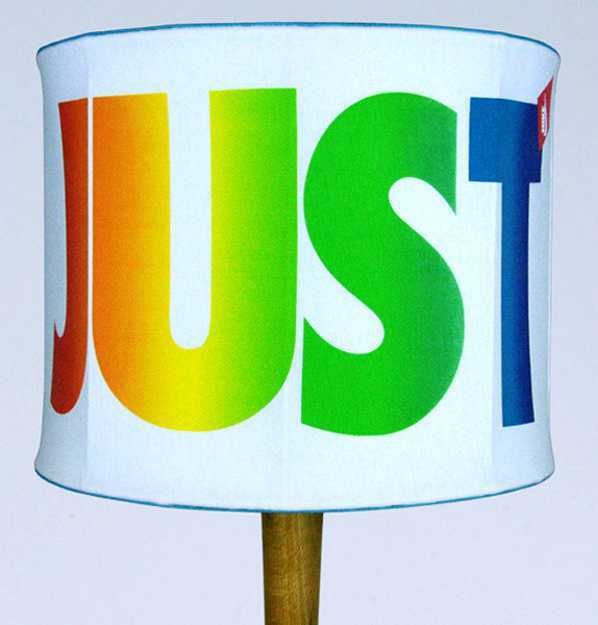 These creative lamp shades from Belle & Videre are bold, cheerful and beautiful, but very expensive. 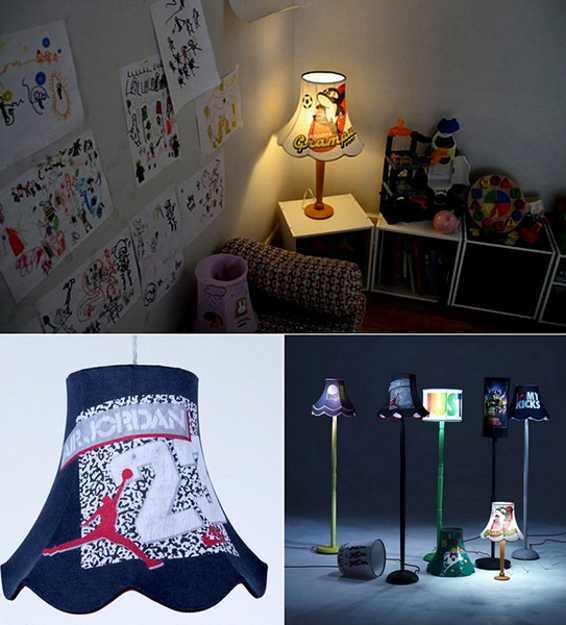 DIY projects inspired by the bright lamp shades can solve this problem, adding wonderful lamp shades to your interior decorating, pleasing children and amusing adults, and saving you money on new lampshades. 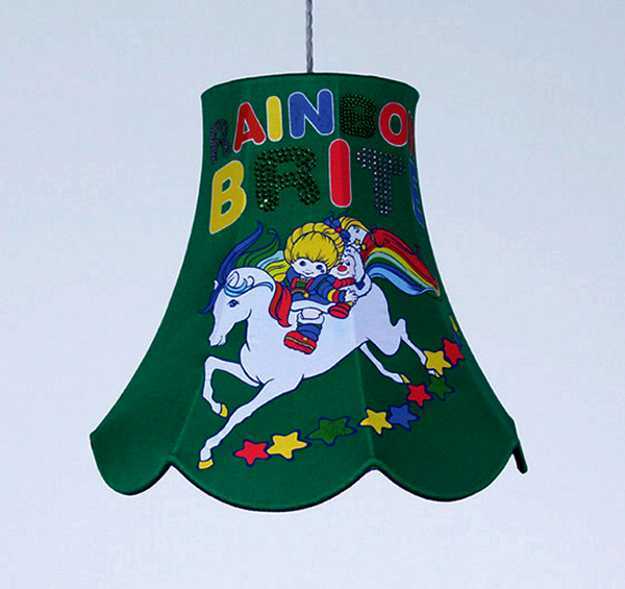 The colorful lamp shades are created by English designer Mandy Fleming and show an elegant and stylish way to recycle old clothes, turning clutter into treasure and making kids room decorating more fun. The designer cleaned out her closet for creating clutter-free home while making these impressive, interesting and very original lamp shades that offer great eco friendly products for colorful interior decorating. 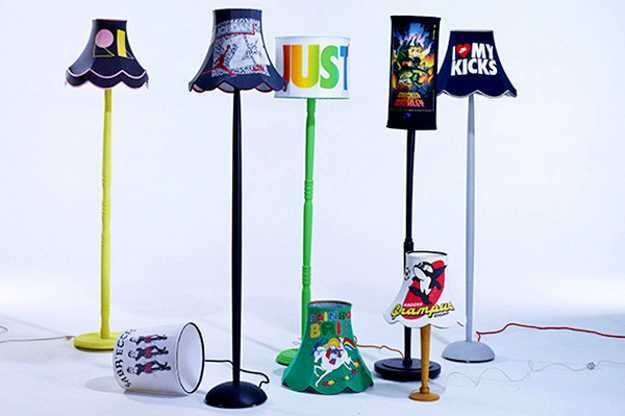 The lamp shades can be decorated with anything and everything that you have in your cluttered closets. Changing your wardrobe and decluttering are wonderful inspirations for designing your own custom-made lamp shades for your lighting fixtures. Old T-shirts are ideal for adding a personal touch to lamp shades while decorating and staging your home for more organized green living and stress-free lifestyle. Lighting fixtures are called T-Lights Collection. 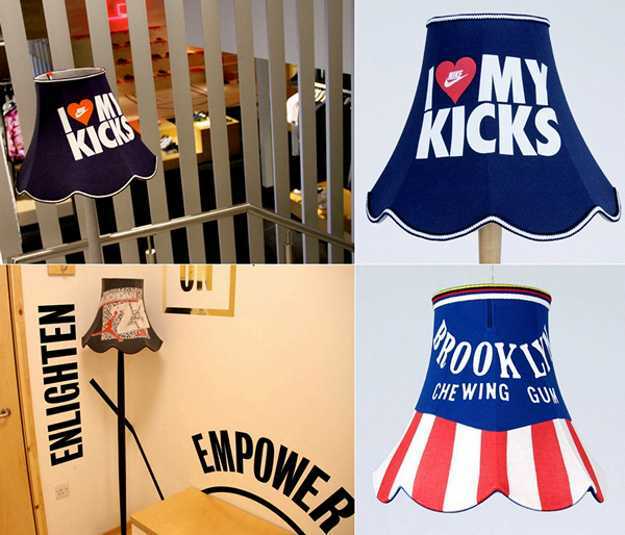 The lamp shades demonstrate how creatively your can painlessly get rid of clutter and recycle old clothes, especially if you get attached to things in your life. These bright and cheerful lamp shades are decorated with pieces of T-shirts, adding a nostalgic charm and meaningful details to lighting fixture designs. Favorite characters, fun prints, beautiful pictures on T-shirts, that remind you about special events or wonderful trips, do not need to be lost forever. You can decorate your lamp shades with them instead. Recycling your favorite T-shirts gives them new life and create unique and very original modern lighting fixtures in bright colors. Easy to make, these fantastic lampshades can add gorgeous, stylish and cheap home decorations to kids rooms or all other rooms in your home. The designer lighting fixtures with T-shirt-lamp shades are available from Belle & Vidére, www.belleandvidere.co.uk/, the lamps manufacture that produces modern lighting fixtures with lampshades made of decorating fabrics and glass. Handmade lamp shades, recycling T-shirts, are unique and exclusive, perfect for personalizing kids room decorating and creating cozy and intimate living spaces. 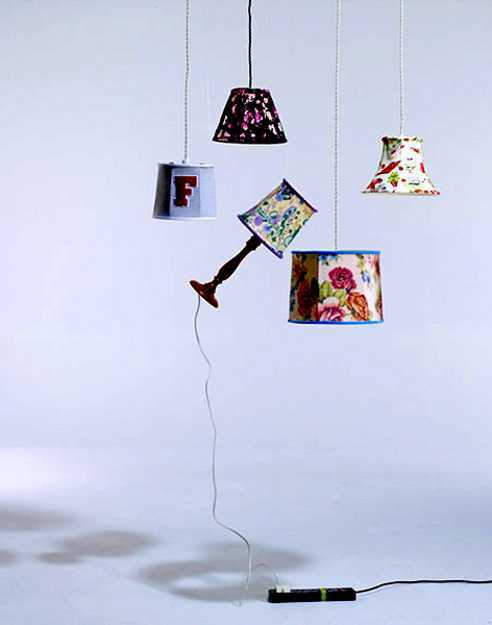 Creative, playful and colorful, these lamp shades look nostalgic and familiar, while adding a contemporary flavor to stylish home interiors and modern kids room decorating ideas.